Leatherback sea turtles, Green Sea sea turtles and Hawksbill sea turtles all nest in the Northern Caribbean area of Tortuguero. Along with the village of Tortuguero, this area hosts the Tortuguero National Park, a network of scenic and navigable waterways. 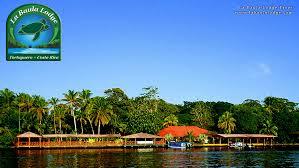 Tortuguero National Park is located on the Caribbean sea, about 80 km north of the village of the same name. 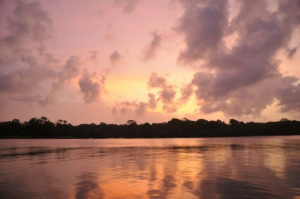 Tortuguero National Park was established in 1975. It has an area of over 40,000 acres in land and over 100,000 acres of protected marine areas. Although turtles can be seen throughout the year, the nesting season for Hawksbill turtles and Green Sea turtles runs from late June through October with a peak in mid August. 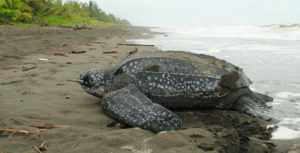 The Leatherback turtles nest from early February until the beginning of May. 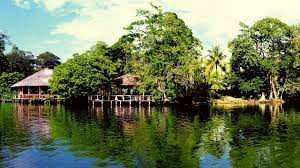 The canals of Tortuguero are sprinkled with unique lodges that offer a charming place to stay as well as a base to explore the village of Tortuguero, tour the canals, visit the national park, and take a turtle nesting tour. Laguna Lodge is the perfect option for staying in the area and taking full advantage of what the region offers. Laguna Lodge is built on a narrow strip of land, 650 feet wide, between the main lagoon and the Caribbean Sea. Its rooms, reception, restaurants, bars and swimming pools are distributed amidst six acres of wonderful gardens with amazing views of the lagoon and direct access to the beach. If you happen to be looking for a tranquil and picturesque escape with lovely views and fine amenities, La Baula Lodge is your ideal choice. The rustic lodge is situated on the riverbank of Tortuguero enveloped by lush jungles and is only accessible by a water taxi. La Baula Lodge is owned and managed by a local family, The Valverde Family, who originally hails from Monteverde. They bought the lodge in 2010 and turned it in to a popular retreat. The staff is cordial and ensures that each guest has a comfortable stay. They offer 45 standard rooms with basic amenities like ceiling fans, private bathroom with hot water supply, reading lamps and terraces. La Baula Lodge also features a swimming pool, bar and a restaurant. 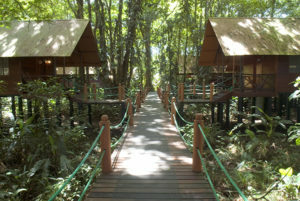 The whole lodge is surrounded by greenery luring plenty of howler monkeys, spider monkeys, sloth, toucans, parrots, trogons and other colorful tropical creatures. Travelers who wish to enjoy a simple holiday in a secluded location amidst sublime nature will find La Baula Lodge absolutely amazing. Visit Tortuguero and stay at any of the Adventure Hotels of Costa Rica members! The nature available is some of the best among all the ecotourism destinations; well worth two or three days of your Costa Rica itinerary.